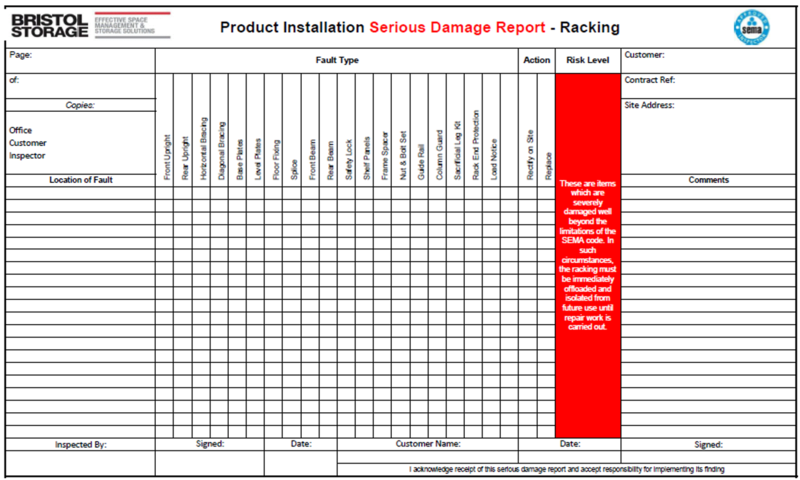 Click here to download your FREE Rack Inspection Sheet and help your team carry out regular safety checks on your racking. Pallet racking is defined as ‘work equipment’, meaning that it’s the responsibility of you as an employer to ensure it is compliant with current Health and Safety legislation; the recommended way of ensuring compliance is with an annual racking inspection. Failure to regularly inspect and properly maintain your racking can result in fines for non-compliance, injuries in the workplace, potential downtime, and expensive repairs or replacements due to preventable damage to your racking system. Find out more about the damage uninspected racking could have on your business, plus download your free rack inspection damage report table from BSE UK below. At BSE UK, we’re SEMA approved racking inspectors, meaning we can carry out independent racking inspections in line with SEMA’s high standards for racking safety. In addition to annual checks, a rack inspection is highly recommended where: damage to racking already exists, you have an upcoming Health and Safety inspection or you do not know the safe load capacity of your racking. Layout plans, best practice observations and recommendations. At the end of the inspection, you’ll be provided with a comprehensive, easy to understand report detailing the current health of your pallet racking or shelving system, safe working loads of your racking system, and a clarification of all damage with recommendations to ensure compliance and extend the life of your racking system. Front and rear base plates. Front and rear floor fixings. Front and rear floor beams. Front and rear safety locks. Rack safety awareness training is a cost effective way of ensuring that you and your staff understand how to spot damage to racking through routine visual inspections, how to maintain your racking system and also how to put measures in place to reduce the risk of any damage to racking occurring. At BSE UK, we’re SEMA approved racking inspectors, meaning we can carry out independent racking inspections in line with latest SEMA and HSE guidelines. If you’re concerned about damage to your racking or want to book in for an inspection – call our team today on 0117 955 5211.